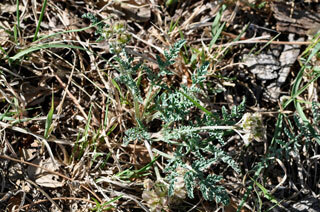 Cymopterus montanus Nutt. ex T. & G.
Stems: Stems apparently absent or essentially so. Pseudoscapes 2 to 12 inches. Leaves: Basal; petiole 1/5 to 4 inches; blade pale green to grayish green above, 1-2-pinnately compound, ovate to oblong-ovate in outline, .6 to 3.2 inch long, 1.2 to 1.6 inch wide; leaflets .2 to 1.2 inch, ultimate segments oblong, 1/50 to 1/12 inch wide. Inflorescences: Compound umbels, compact, terminal; involucral bracts absent or linear-oblong; rays 1/25 to 4/5 inch; involucel bractlets scarious with green midvein, ovate-oblong, distinct or slightly connate, apex sometimes fringed. Flowers: Calyx lobes absent or minute; petals 5, white or lavender, 1/25 to 1/16 inch; stamens 5; styles 2; stigmas 2. Fruits: Schizocarps splitting, ovoid to broadly oblong, 1/5 to 1/2 inch long, 1/6 to 2/5 inch wide, wings conspicuous, often purple-tinged, twice as wide as body; seeds 1 per mericarp. Uses: The Navajo cooked the plant with wild onion or wild carrot and ground the baked roots as a substitute for cornmeal. Comments: Cymopterus species have subterranean stems, called pseudoscapes that arise from the rootstocks and bear leaves and peduncles at the soil surface.